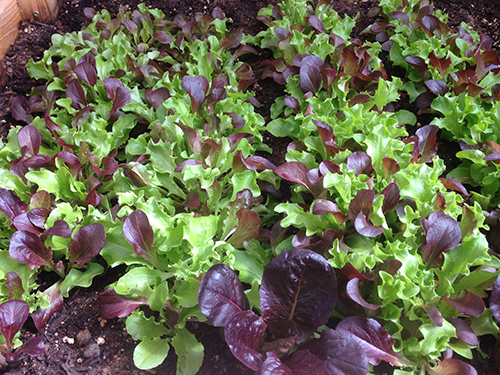 Thinning and preparing mesclun/greens-keeping your homegrown greens fresh! 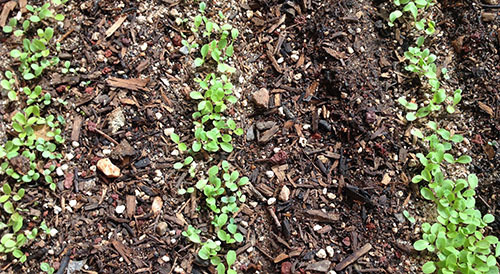 Here are my steps to thinning and preparing mesclun so it doesn’t WILT in your refrigerator. 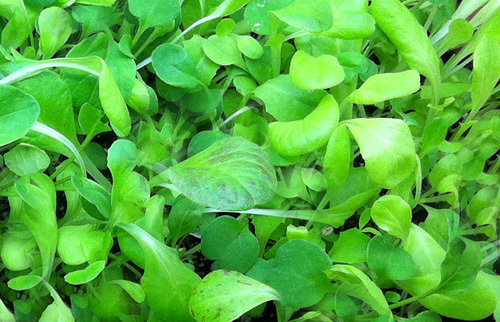 In fact you can use this method after you clean any greens in ANY STAGE from microgreens to full grown lettuce and greens from the garden or store bought. 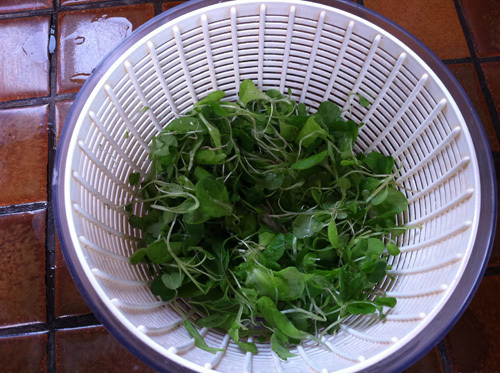 Here is the mesclun in my salad bowl I made. Notice they are very cramped with not much dirt showing. I need to thin these out so the leaves can get bigger without overcrowding. 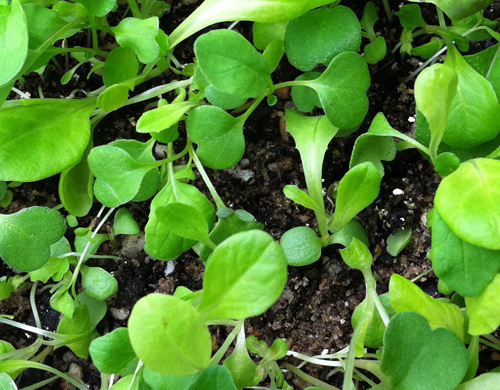 Thin out the mesclun. 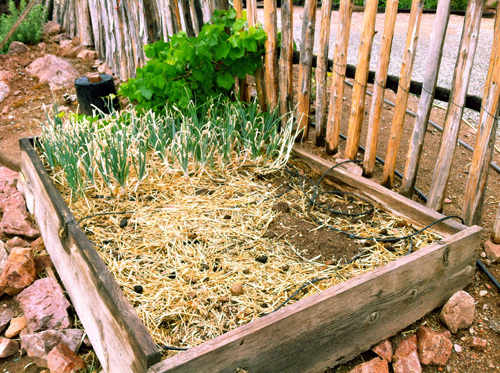 The goal here is to have some dirt showing to give the remaining leaves some room to grow. 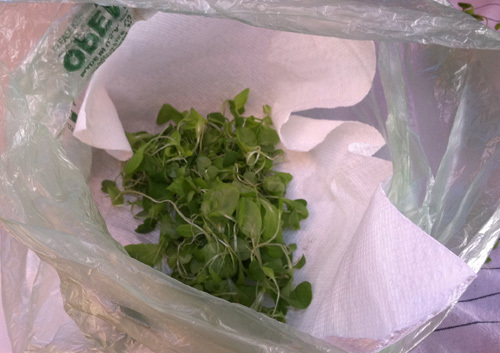 Now the mesclun (first thinnings) are like microgreens and are ready to clean. Notice the roots are still on them. You can cut them off or eat them if you rinse well. Here I’m leaving them on. Of course you could just feed them to the chickens or throw them out but I don’t like to waste them plus they are yummy! 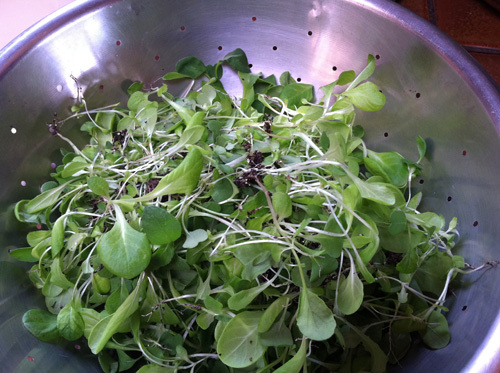 You would pay big bucks for just a tiny bit of microgreens in the stores. 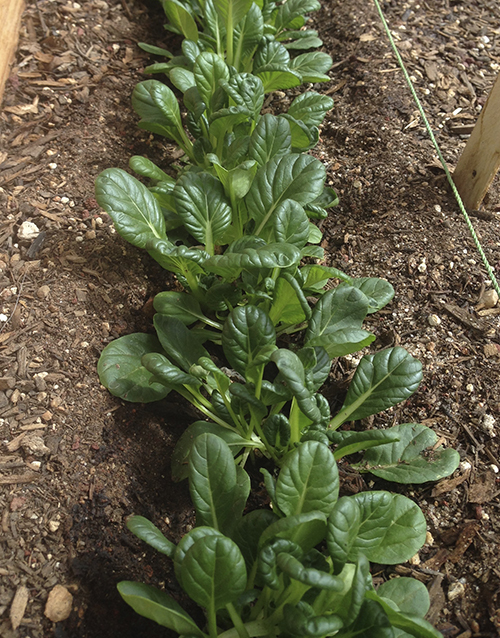 Here is the mesclun at the first rinse. I first clean my sinks out with bleach so I know they are clean. I suppose you could use big bowls to rinse instead. I filled my sink with COLD WATER from the faucet. 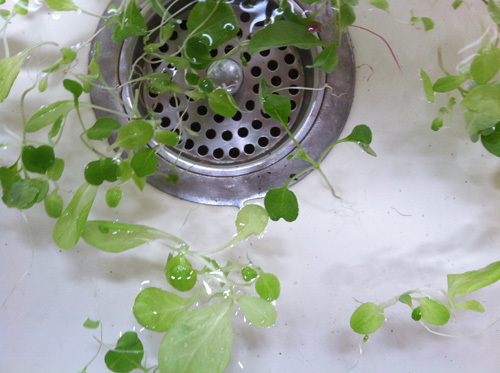 Notice the leaves float on top while the dirt mostly sinks to the bottom. 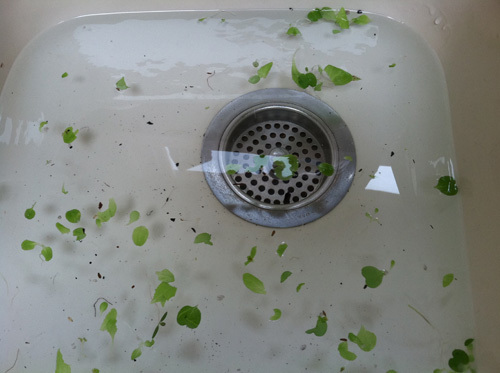 From here I gently scoop out the leaves trying to leave the dirt on the bottom of the sink or bowl and transfer them to the other side of the sink full of water for the second rinsing. By the way, rinsing this way is way easier than using a colander. It works really well for spinach too. This way removes the dirt that can stay in a colander. 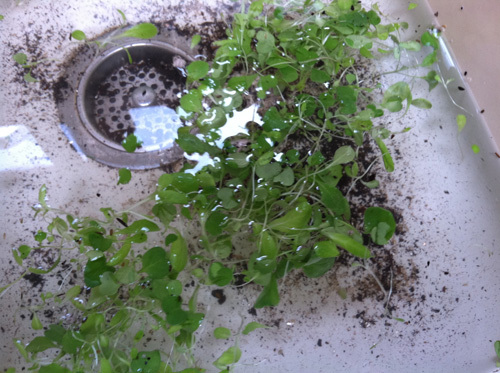 Second rinse-Notice most of the dirt is gone at the bottom of the sink after I have removed the leaves. The last rinse- notice the dirt is gone. Rinse more if you still have dirt. 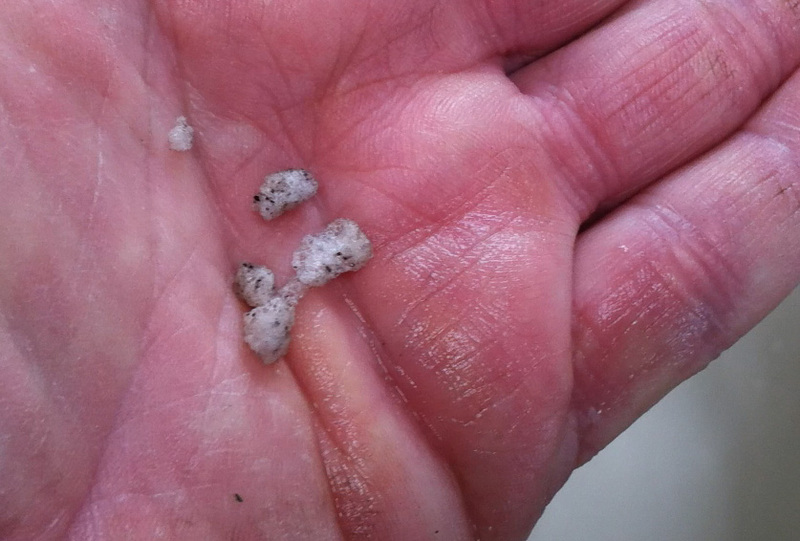 Since I grow the lettuce bowl inside, I use seed starting mix and you need to look out for the perlite that is in it as it can float in the water instead of sinking like the dirt-so be on the lookout for it. 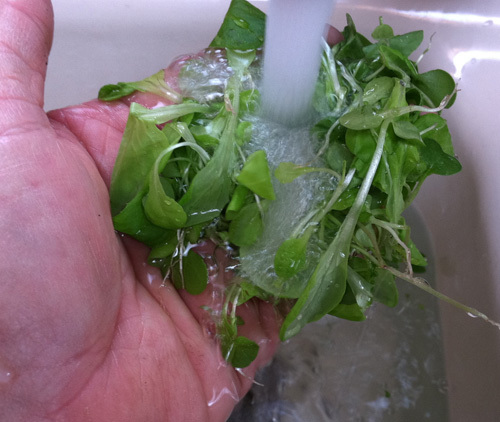 Just scoop them off the surface of the water before you do each rinse. It would be a little too crunchy in my salad! Now the leaves are ready for the spinner. Just don’t pack it too full as the leaves are very delicate. 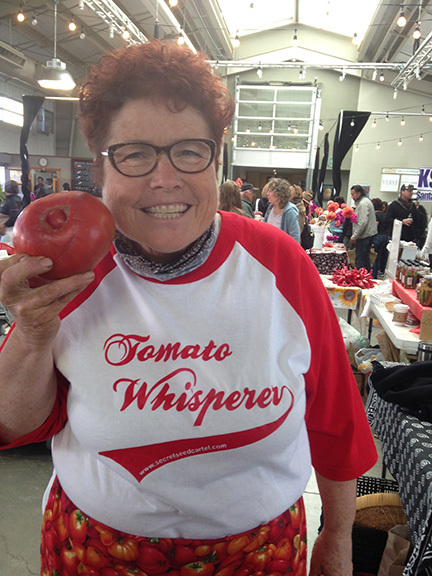 Spin it in small batches and..
squeeze the bag so there is only a small opening and blow into the bag with your breath. 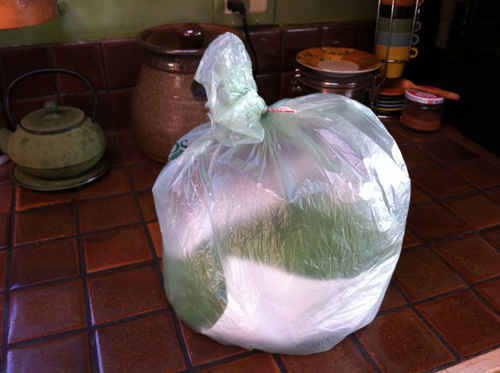 This will fill the bag with carbon dioxide (which we expel) and then blow it up till it is full and..
tie off with a twistie tie so the air doesn’t escape and put into your refrigerator. 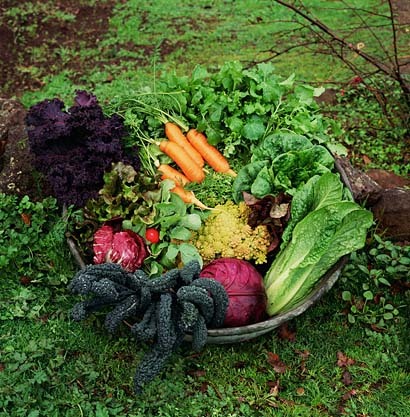 YOUR GREENS WILL STAY FRESH FOR ABOUT A WEEK. 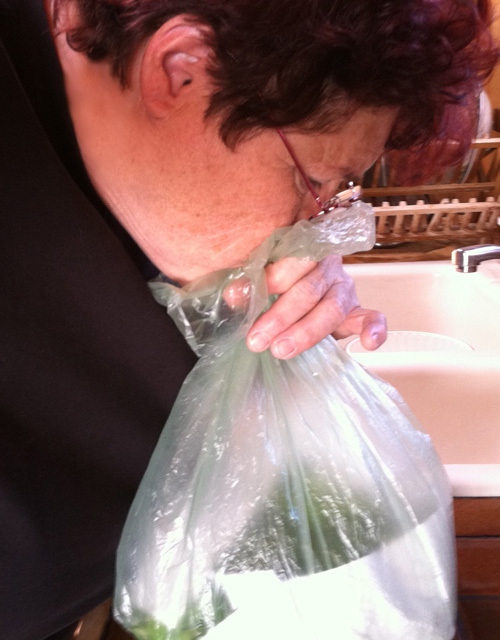 Be sure you blow into it each time you get some greens out before putting it back into the refrigerator again. This takes up a little more room in your refrigerator but is worth it. 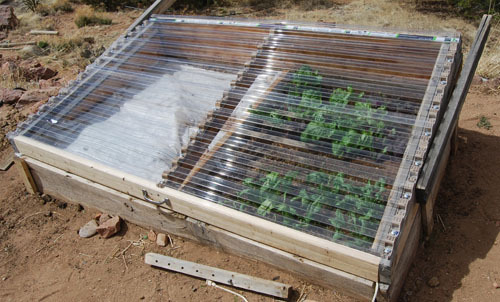 No more homegrown wilted greens! Pretty cool trick, huh?! 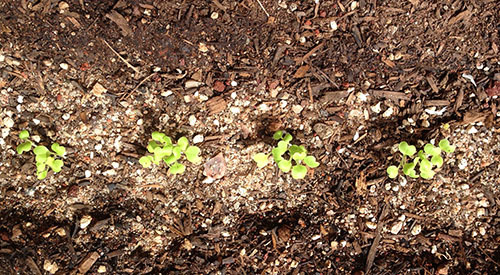 Here is the lettuce bowl I planted on Mar 7, only 13 days ago. Remember how it was barely coming up where it hung off the seed heat mat-well no more! 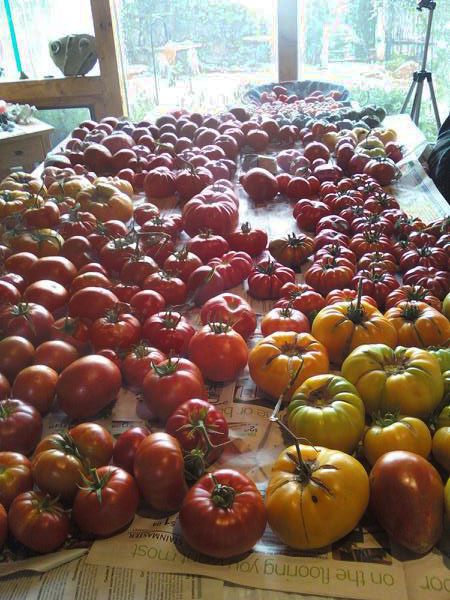 It is coming up beautifully. It’s so nice to see a ‘sea of green’ in the house. 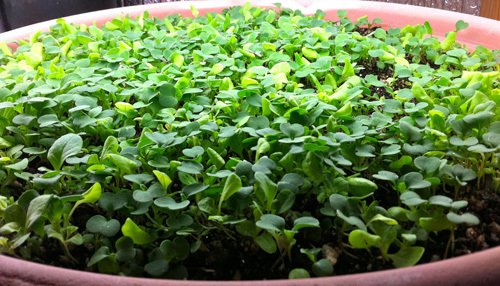 I will thin the baby seedlings (eating them) to give the rest of the seedlings some room to grow bigger. 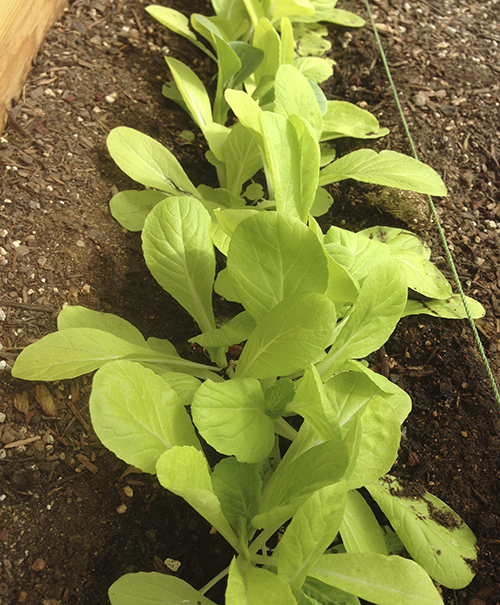 This is a mesclun lettuce I got from the Homegrown New Mexico seed swap event. 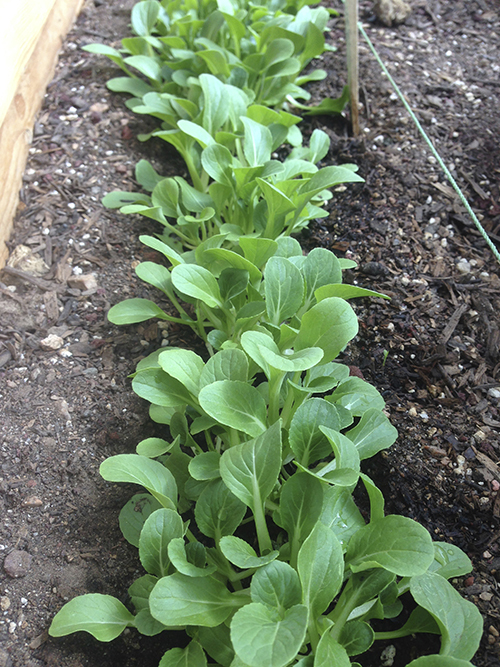 It is about 2 weeks ahead of the the lettuce I just planted outside. 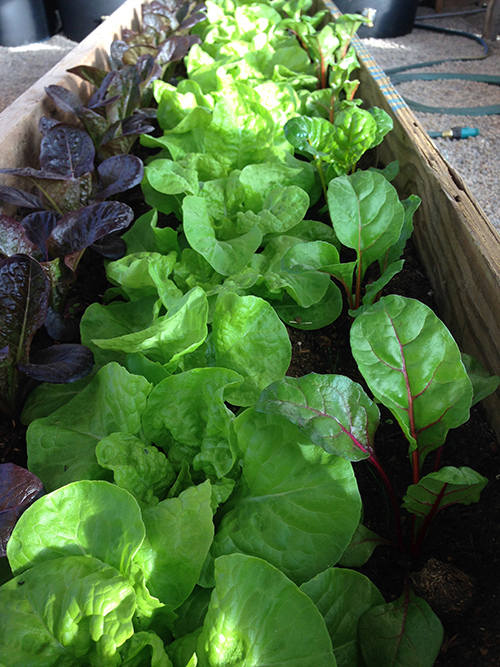 All part of trying to keep a continuous supply of lettuce for awhile. A couple more weeks and I think I’ll have a salad!